In this verse the word Waseela (medium ) refers to a Kamil Murshid. According to dictionary waseela (medium) means such source or means through which one can reach ones destination and it should be so helpful that all the needs of the needy are fulfilled and he is completely satisfied by obtaining all goals of his life. Lissan-ul-Arab (volume II-page 725) defines Waseela as "by means of which closeness to some other thing is achieved". According to Shariat, Waseela (medium) means to find closeness to Allah through a person who is already close to Allah and His beloved, who has travelled the mystic path and knows its ups and downs. In Tasawuf such person is known as Murshid, spiritual Mentor and guide. A true Murshid is the one who knows the way to Allah perfectly and who has reached the Divine Oneness and now is fully capable to guide the common people who do not know the way to Allah. A Perfect Murshid saves them from the satanic illusions and destructions of the nafs (the baser self) and all the other obstacles. So, now the above mentioned verse may be translated as "O' believers find a Perfect Murshid and guide to reach Allah". Meaning: One who is not guided by a mentor is verily guided by satan. Meaning: If you could find some guide just like Hazrat Musa Alayh Salam found Hazrat Shoaib Alayh Salam, you can easily become "Kaleem" (someone who directly talks to Allah) from a Shaban (shepherd), as Hazrat Musa did. In the Holy Quran Allah also emphasizes to approach such a mentor who is accomplished in Zikr (invocation). And Allah never goes against His promise. Those who desire world and worldly treasures and wealth, false respect and power or heaven and its pleasures would get a guide according to their desires. But those who purely seek Allah's Qurb (proximity) and His Deedar (Vision) are guided by Allah Himself towards Murshid Kamil (the perfect spiritual guide). This guide purifies and sanctifies the Batin (inward) and the soul of the seekers, according to the way of our Holy Prophet Sall'Allahu Alayhi Wa'alihi Wasallam, as mentioned in the Holy Quran. The spiritual guide not only purifies the soul of the devout but also unfolds before him the reality of this mortal and deceitful world. The purified soul, when finds the true pleasures of closeness to Allah and His glorified Vision, all the temporary pleasures of the world lose their charm. So, the devout struggles to get closer to Allah, instead of running after these short lived pleasures. Now, he has no lust for wealth. All the luxuries are meaningless in front of Allah's will. To please Allah, he becomes humble and submissive. He does not expect anything from anyone except Allah; rather his submissiveness makes it easy for him to remain contented and happy in every situation. He always trusts upon Allah. He not only gets rid of lust and greed but is also freed from the fear of all others except Allah. So no one can force him to do wrong. He comes to know that no position or post is better than being close to Allah, so he never does anything wrong to get material wealth, position, false respects or worldly glory. He also knows that a soul captured by the curses of greed, vanity, lust, malice etc. can never get close to Allah, so he becomes pure in his behaviors with others, as well as, never lets any vicious thoughts about others to overcome his mind and soul. In this way, not only his inner self is set right but his extrinsic self and behaviors are also improved, and all this is by the virtue of Murshid Kamil. In this verse 'knowledge' refers to the intimate Gnosis and knowledge of Allah and not the worldly knowledge, and this knowledge can only be gained through Zikr and Tasawur-e-Ism-e-Allah Zaat under the guidance of a Kamil Murshid. Who is a Murshid Kamil (the spiritual mentor)? What qualities does he possess? How does he submerge the seeker in Divine Oneness and bless him with presence in the Assembly of the Prophet Mohammad Sall'Allahu Alayhi Wa'alihi Wasallam? And what is his own status and powers? Murshid possesses the Divine Powers as he is Fana Fillah (annihilated in Allah) and Baqa Billah (immortal with Allah). With these powers he kills the alive nafs (vehement inner self) of the seeker and thus gives life to his dead soul. Murshid is free from all needs. He is just like a Paras stone which turns everything to gold that touches it. Murshid is like a Kasauti (touch stone which checks the purity or impurity of a substance). His single glance is beneficent like sun, which removes all the bad qualities from the seeker. Murshid (spiritual mentor) is also like a dyer (who diverts the attention of a seeker from materialism to spiritualism, thus changes his inner color). Murshid is also like a betal leaf chooser who separates the useful betal leaves from the rotten ones. Murshid is virtuous like Prophet Mohammad Sall'Allahu Alayhi Wa'alihi Wasallam as he possesses all his virtues, more kind than parents, guide and mentor on the way of Allah, bestower just like a mine of diamonds and gems, like an ocean filled with pearls of kindness, problem solver like a key for every lock, indifferent to worldly wealth, free of all the greeds, loving the seekers more than his own life, dervish having none of material luxuries. meaning: "die before death", thus his soul has become alive. Such seeker is the one who can suffer the hardships on the way of Faqr, while, the disobedient seekers are egoistic and stubborn. Meaning: Kamil Murshid should cleanse (the soul of a seeker) like a washerman washes clothes. He does not indulge his disciples in lengthy prayers or hard mystic exercises, rather he purifies the soul of the seeker with his Divine attention and glance and through Ism-e-Allah Zaat, leaving no filth or dirt of worldly desires and intrinsic diseases inside the seeker. Thus, he makes the soul of the seeker pure enough to love only Allah and to be loved by Allah. O' Bahoo! 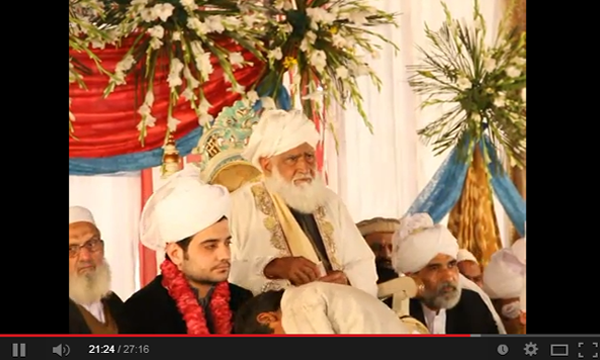 Such a Murshid is alive in the bones and flesh, rather in every cell of the seeker. Meaning: I wandered in the forests and deserts in search of Allah, made hard mystic exercises, seclusions, continued recitals but all in vain. Neither thirty fasts nor five daily prayers fulfilled my heart's desires. All my prayers and wishes were answered when my Murshid put a glance of kindness upon me. Meaning: If your mentor is not able to give relief to your inner pain then such mentor is useless. The mentor who cannot change the state of your heart has got no spiritual powers, how can he guide you on the way to Allah? So what's the use of having such a mentor? But if you have got true Murshid who can take you directly to Allah then do not hesitate to sacrifice even your life for him.